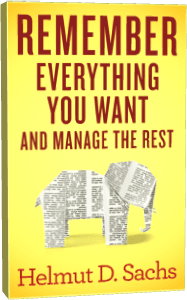 I’ve spent quite some time during the past few months updating Remember Everything You Want and Manage the Rest. The new version is 1.1 and available on Amazon. All illustrations, maps, screenshots, and tables have been redone with a higher resolution and color adjustments to allow for better viewing on the new Kindles and tablets. The book should, however, continue to work well on older Kindles and in the reading apps. New legends and call-outs have been added to make it as easy as possible to find stuff. The illustrations and step-by-step guidelines for knowledge and information management have been updated to match the latest versions of the software tools. While the software and website changes haven’t been huge, I wanted to make it as easy as possible to follow the guidelines. The formatting of the book has been loosened up. The book now also allows for a free choice of fonts on Kindles that support this. The notes and bibliography sections have been expanded. The section on the Phonetic Number System has been updated. Various smaller improvements and corrections have been made throughout the book. If you have already bought the book and would like to get hold of this updated version (1.1), please contact Amazon’s customer service and have them update the book in your library. I have done this successfully for several books (including this one) where I wanted to read an updated version. I usually use their chat function and they just walk me through the steps. You should not have to repurchase the book! In fact, if you delete and then repurchase the book, you will likely get the version you already had (Amazon keeps track of this). How do you know whether you already have version 1.1? 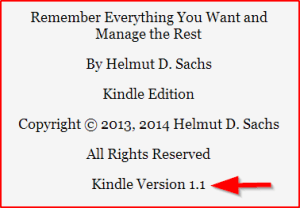 If your book doesn’t contain the line “Kindle Version 1.1” in the copyright section, you have version 1.0. First-time buyers of the book will of course automatically get the newest version (i.e., version 1.1) delivered to their Kindle and library. Thank you very much for your feedback, your good wishes, and for supporting Remember Everything You Want and Manage the Rest. Thank you for this e-mail message. I will contact Amazon and TRY to upgrade to v1.1. I bought your book “Remember Everything” last month and you have my applause. Thanks for the updates! I emailed Amazon and had the updated version within minutes. Your book is terrific. Is there a way to purchase a printed version, even in a PDF? thank you very much for your uplifting words and your support! I am sorry, a printed version is not yet available. I’ll be happy to send you a quick mail when it is available. Hello Avid Reader, A big Thank You for taking the time to post a review. It is very much appreciated and encouraging! Have a wonderful day!